The New Pendulor consists of a high-efficiency power extractor of the pendulum type installed in a pile supporting structure and a solid back wall, which will act as a detached breakwater. 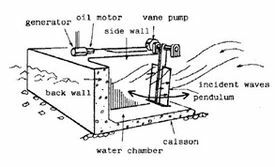 The structural system is designed to distribute the incident wave power to be reflected, absorbed and transmitted through a hydraulic pump. The back wall has low crest elevation to decrease wave force at storm waves, and a clearance between its bottom and the seabed to allow on-off shore movement of sediment. This page was last modified on 19 May 2014, at 16:51.